A: Your panes will be polished by a team of verified and background-checked window cleaning technicians. Q: What services does window cleaning Norbury provide? A: The cleaners will perform exterior window cleaning with the help of the latest water-fed pole equipment on the market. For buildings above the fourth floor, we'll dispatch seasoned climbers for rope access window cleaning. For inside pane polish, the team will employ standard ladders and squeegees. A: A couple of of raindrops won't disrupt the Norbury window cleaners' work – rainwater is usually deposit-free. However, if we face a cloudburst, then we will kindly ask you to re-schedule your booking for another day. A: Yes, any PVC or UPVC frames and sills that your property features will be washed with no extra charge as part of our service. Q: Can you perform your service while I'm out of town? A: As long as the specialists can pass through your front gate, they can wash away all dirt without you having to be close by. If your panes need a thorough interior polish as well, then we'll carry out a fast key pick-up and delivery service. A: Usually, the purified water tank inside the team's cleaning caravan is always full. In case the tank is empty and with your consent, the specialists can painlessly link the water-fed rod to any accessible water source. A: If the team is nowhere to be seen because of major traffic, we will inform you about the setback and get in touch with you as soon as they arrive. After reading through lots of client feedback, we've altered our window cleaning Norbury's charges. Now, you can hire our service at prices that are nothing short of affordable! For further information, please consult with our price table below. 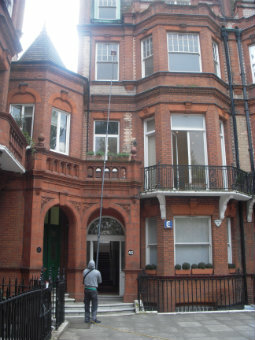 We've designed our window cleaning in Norbury with flexibility in mind. As a result, our service is now frequently booked by business and household customers alike. Let's go over our window cleaning choices on offer. With our external cleaning, you can deftly polish the windows of any domain with four or less floors. The seasoned technicians will show up in a cleaning vehicle. The window cleaners in Norbury will then connect a convenient water-fed pole to the van's water storage. The special filtrated water will be released through a brush-head installment at the pole's end under powerful pressure. When the fluid evaporates under the sun, your windows will stay spotless for weeks to come. For buildings above the fourth storey, we'll send in practiced climbers for rope access window washing. Equipped with sturdy ropes, cherry pickers, and ladders, they will analyse and rejuvenate any high-rise domain over the course of one afternoon. Should you need risk appraisal reports, we'll happily provide them for you. We also take our tasks to heart and will abide by all safety regulations. If your glass surfaces are muddy on the inside as well, the specialists can perform interior cleaning with ladders and sponges. As we received more and more positive responses from our customers, the need for window cleaning in Norbury has noticeably skyrocketed in adjacent areas. You can find the areas we've covered in the list below. For those of you who'd rather book window cleaning services Norbury SW16 online, fill in our get a free instant quote form.